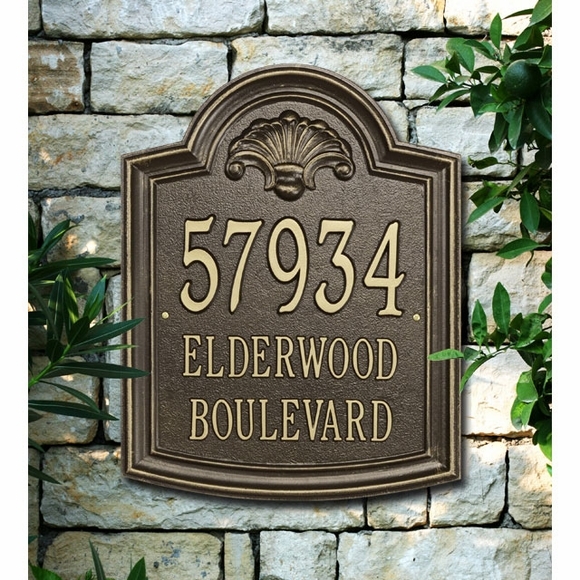 Personalized Tablet Arch Address Sign - - three line elongated arch address plaque is available for lawn or wall mount. Made in USA. Classic shell motif enhances the impressive arch and reinforces the stately theme. This plaque is designed for three lines of personalization. Line 1 holds five 3" numbers. Line 2 holds twelve 1.25" characters (including spaces). Line 3 also holds twelve 1.25" characters (including spaces). Dimensions: 11"W x 14"H and 14.875"W x 18.875"H.
Color combinations: BG black plaque with gold characters; GG dark green plaque with gold characters; PS pewter silver; AC antique copper; OG bronze gold.